There’s a popular saying “only rain down the drain.” Well, when it comes to cooking and preparing meals in the kitchen, only “water down the drain” is apropos. However, more than often, fats, oils and grease otherwise known as “FOG,” are a common occurrence. Since sewer pipes and systems were not designed or meant for FOG, when this type of cooking byproduct gets into the drain, they wreak havoc and cause blockages and backups. Here are some simple tips for preventing FOG from going down your drain! 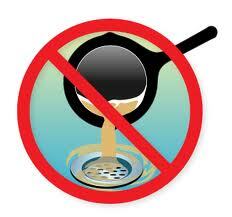 NEVER pour grease or oil down sink drains, garbage disposals or into toilets. Scrape congealed grease from foods, plates, pots, grills and cooking surfaces with a rubber scraper or squeegee and then place this FOG into a sealed can that you can dispose of in the trash. Be mindful to cover or put the FOG into a sealed plastic bag so it won’t spill and place into the trash. If you have a FOG spill, use paper towels (made from recycled-content paper) or rags that you can dispose of properly. Never wash or rinse oil or greased soaked cloth rags in a sink because that will only send oil and grease down the drain, clogging pipes. Do not rely on commercial additives including detergents that claim to “dissolve grease.” This will only pass the grease down the line to cause problems in other areas. If you have a large grease or oil spill on the ground, using absorbent kitty litter is a great way to soak up the spill. Then, dispose of the kitty litter in the trash.